The mineral calcium is probably one of the most well-known minerals in terms of nutrition, yet also one that many get confused about with regards to amounts and sources. In our bodies, about 99% of the calcium is found in bones and teeth. 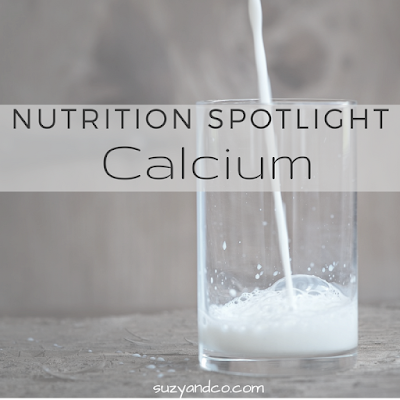 Besides providing structure and strength to bones and teeth, calcium has many functions in our body. 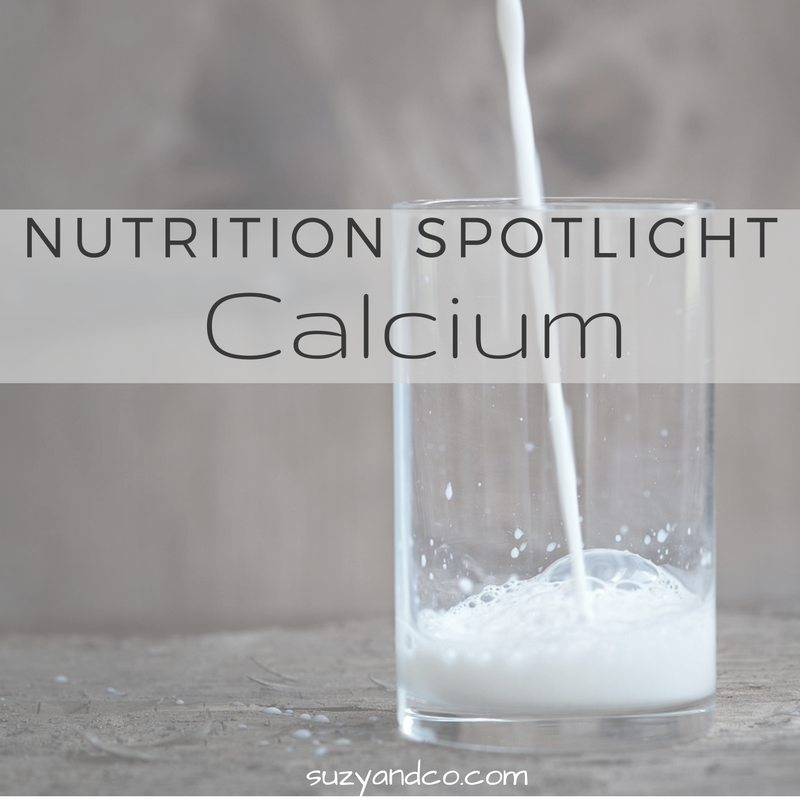 This article will give you an overview of how calcium is digested and absorbed, the different functions it performs in our bodies, and food sources. There is a free printable at the end of this article that will give you amounts in various foods. Although I would suggest at least reading the first section - digestion & absorption - to get a better understanding of how much calcium your body may actually be absorbing. Besides provides structure for our bones and teeth, calcium actually has a plethora of functions. Calcium helps nerve conduction, muscle contractions, enzyme regulations, and cell wall structure. Calcium is also involved in hormones. Calcium in food and supplements is usually in the form of calcium salts. The calcium must be released from the salt in order for our bodies to absorb the mineral. The acidic environment of our stomachs actually helps to free the calcium from the salt. Once calcium passes through the stomach into the small intestine, absorption can take place. Most calcium is absorbed in the small intestine, however, the large intestine can also play a role. Bacteria in the large intestine can release calcium bound to fiber. This most often happens in those who absorb less calcium in the small intestine. Therefore, maintaining optimal health in the large intestine through pre- and probiotics is recommended. In the small intestine, vitamin D plays a key role in calcium absorption. It enhances calcium absorption, helps transport calcium across cells, and also works with the kidney and bones when calcium levels are not stable. I know I am not doing the science of it justice. The actual processes are very complex and many may find them boring and too detailed for a post like this. however, Vitamin D is a very important component of Calcium and is commonly added to things like milk or calcium fortified foods in order to help your body utilize the calcium. Children absorb more calcium than adults. Numbers vary but the ranges for absorption are: children will absorb ~60 - 75% of dietary calcium, whereas adults absorb closer to ~30%. Many factors will affect absorption of calcium. Absorption of calcium from dairy foods is about 30%, whereas absorption from some green vegetables could be 60%. However, there are substances in green vegetables, and other non-dairy sources like wheat and beans, that will bind to the calcium and make it unavailable for our body to use. These substances are oxalic acid and phytic acid. Oxalic acid (or oxalate) occurs in plants and vegetables. Common foods that contain oxalic acid are kale, spinach, rhubarb, beets, and some nuts and nut butters. Cooking foods will actually help break down the oxalic acid so that the calcium can be absorbed. However, if you are not relying on one of these foods to get all your calcium, consumption of them, along with a variety of others foods should not be an issue with calcium absorption. Phytic acid (or phytate) also occurs in plants and vegetables. Phytic acid is found in beans, seeds, nuts, and whole grains. Although cooking will not reduce phytic acid, you can reduce it by soaking, sprouting or fermenting. So go ahead and eat that sourdough bread to your hearts content! Calcium deficiency is one of the most common nutrient deficiencies seen in children. Children tend to drink a lot of milk in the toddler and preschool years. When milk replaces food or if they are drinking it at the same time as meals, the calcium in milk will block the body's ability to absorb iron, like I mentioned in the section above on calcium blockers. It is also more common in older adults to have a calcium deficiency due to decreased stomach acid. As we age, our body produces less acid. Calcium is broken down in an acidic environment, so if the stomach is not producing enough acid, the calcium will be bound to salts and unavailable to the body. Having more protein in the diet, which stimulates stomach acid, could help older adults with calcium deficiencies. I always recommended to get your nutrients from whole foods first when possible. Nutrients in whole, unprocessed foods have other nutrients that work synergistically together to help your body absorb the nutrient/s better. Although science has come a long way, there are always new discoveries that are happening in the field of nutrition. There could be other substances in whole foods we have yet to discover that help our body absorb and utilize calcium. However, there may be times when you want to supplement. Our diets are not perfect (even nutritionists), our soil is not perfect, and our bodies sometimes need some help. If you take supplemental calcium, like in pill form, your body can only absorb at most 500mg at a time. Therefore taking more calcium at one time is not recommended and really a waste of money. There are several forms of calcium. The two most common being calcium carbonate and calcium citrate. Calcium carbonate is more bioavailable, therefore you will absorb more - ~40%. it is also less expensive, however, it may be harder on your stomach and should be taken with food. Calcium citrate is less bioavailable at ~21%, but is easier on your stomach and does not need to be taken with food. One of the most common questions I get is; other than dairy, what foods provide calcium and how much? Some people do not eat dairy due to sensitivities, lactose intolerance, or a vegan diet. Although the absorption and assimilation of calcium is usually better with dairy products, there are many other food sources of calcium. 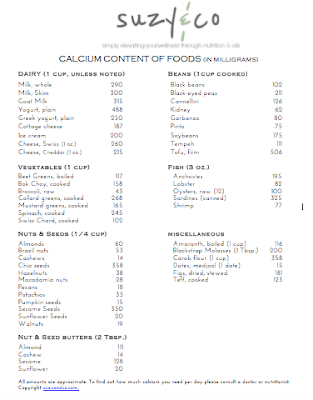 I created this handout on food sources of calcium that you are free to print out. For more posts on Nutrition Information, Click Here.